Cut off an enemy's tail or make a dummy take your hits. 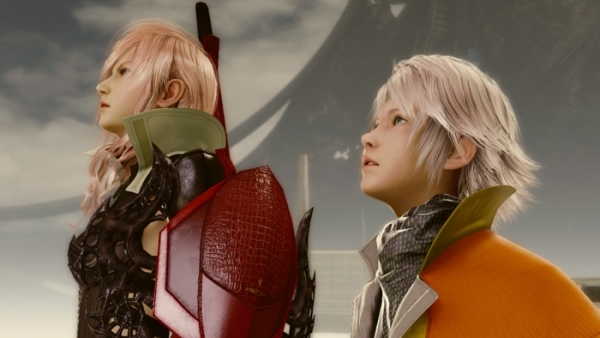 Dengeki Online recently sat down with Lightning Returns: Final Fantasy XIII design director Yuji Abe, who revealed new details about the game’s Glory Point and battle systems, seamless world, dungeons, and game flow. You can use GP (Glory Points) to stop time on the field and teleport to a specific spot. You mainly earn GP by clearing battles. At first it was shared with Radiant Power (points sacrificed to the star tree Yggdrasil to extend the life of the world), but now they are separate and available regardless of the world’s lifespan. Since Lightning grows outside of battle too, only clearing important event scenes will set a parameter. It’s possible to clear the game as fast as possible without participating in battles. Since strong weapons are sold at the start, you’ll be stronger if you buy them. If you buy the strongest one, you’d probably be fine using it until the last boss. Of course, the price [is so high] you won’t afford it without doing your best. The first play through is difficult, but theoretically it’s possible to grasp everything in one play through. You can go to just about any spot on the map that looks possible. (About 90%.) The dungeon’s structures have a lot of high and low variations, and it’s possible to fall right to the bottom. Basically you can seamlessly go to all the places you are able to walk. Basically anywhere you can walk, you can go seamlessly. You can walk through all the continents, all seamlessly. Since you warp when you are riding a vehicle, it causes loading. That battle system is based on Final Fantasy XIII. It plays basically the same: push that button to attack, if you’re attacked then guard, it’s easy to understand. Once you play it for yourself, it plays comparatively like a regular RPG. You can move in real-time, regulating your actions accordingly, like avoiding when you notice enemies moving into attack motions. I think that a talented person will be able to play it splendidly. Although the basis of a KO is an extension of a break, you can also bring something down in one shot. When your attack hits and your opponent’s HP Gauge part undulates (knockout wave), you know that attack was a weak point of your enemy’s. Also, you can tell the outcome of attacks depending on the variations in the wave’s movement and color until they are knocked out. There is an element where you can destroy part of your enemy. You can cut their tail [for example] by approaching from behind and attacking, though it’s difficult. At least when an enemy is down you can aim. You can also use GP to invoke a dummy to take hits in place of yourself, which makes it easier. You can do this to about a quarter of monsters, including some that aren’t new to the series. As a reward for cutting tails, usually the drop item changes. Also, doing it causes your enemy to become weaker and therefore easier to defeat. Cure isn’t a regular ability, it’s one of the effects of GP. You have to use GP in order to recover. Raise is also similar. Fighting characters appear together and act automatically. It’s very efficient. The battles slip into a lot of action, but if you aren’t able to guard you can still win, like in a regular RPG, if you are strong enough you’ll be victorious. If the degree of difficulty is set to “Easy,” then enemies are weak, you barely consume GP, and you recover HP when you are standing still on the field. “Hard” mode includes stronger enemies and additional elements. The game flows like this: you start on the Ark where Hope is, you adventure for a day and return to the Ark. When it becomes 6 a.m. you are forced back to the Ark, where all the Radiant Power you earned during your day out is offered to Yggdrasil and the world’s lifespan is lengthened. You earn Radiant Power by clearing quests. It’s offered to the holy tree which signifies the world’s lifespan, something like branches and leaves indicating the days grow each time it’s given a fixed amount. It’s only possible to expand its life up to 13 days. If you continue to defeat the same enemies, they’ll become extinct. However, the last one of a species is extremely strong.